Six or seven years ago, the Discovery Channel aired a special arguing we should not completely dismiss the existence of Sasquatch from a scientific perspective. Take that city slickers. Nevertheless, a Chicago smart aleck assumes his girl friend’s Bigfoot expedition is just a big snipe hunt, until things get surprisingly intense in Dan Riessner’s Stomping Ground (trailer here), which screens during the seventeenth Dances With Films in Hollywood, California. Ben considers it a big step in their relationship when he spends Thanksgiving with Annie at her North Carolina home. It is pretty obvious he is not from around these parts, but he tries to be a good sport. That becomes rather difficult when her ex-boyfriend Paul tries to latch onto her again. Knowing Annie’s Bigfoot obsession, Paul suggests a Sasquatch scouting trip with their old buddy Jed, who is still a very gung ho amateur cryptozoologist. Before long, Paul is openly baiting Ben, while Annie tries her best not to notice. With all the bickering, they do not notice an ominous third party is watching them. Is it Sasquatch or the creepy hunters they ran into? To put it in different terms, will the film payoff on its implied ‘Quatch promise or give us some Deliverance bait-and-switch? Regardless, you have to respect any film giving a shoot out to its banjo arranger in the opening credits (that would be Ben Riesser, for the record). In fact, Stomping is surprising respectful in its portrayal of the American south. Likable Jed often skewers Ben’s inbred cannibal hillbilly stereotypes, at least when he is not worried they might be true in this case. Likewise, Annie is a reasonably level headed native Southerner, who is naturally comfortable around guns. Nevertheless, Riesser and co-writer Andrew Genser seem to understand one of life’s profound truths. When things go down, even if it be in the woods, you want to stand next to a city guy, because we have the best developed survival instincts. Most New York and LA readers will therefore be able to relate to “Big City” Ben (played by John Bobeck, nicely balancing snark and earnest doofus-ness), because he is us. If the Discovery Channel did not convince Sasquatch is out there, Stomping probably will not either, but it is a scrappy little indie comedy-drama with a fair degree of genre appeal. Riesser & Genser’s dialogue has a good snap to it and—not to beat a dead Sasquatch—the banjo and string band music is definitely cool. The absence of cheap shots is also a plus. 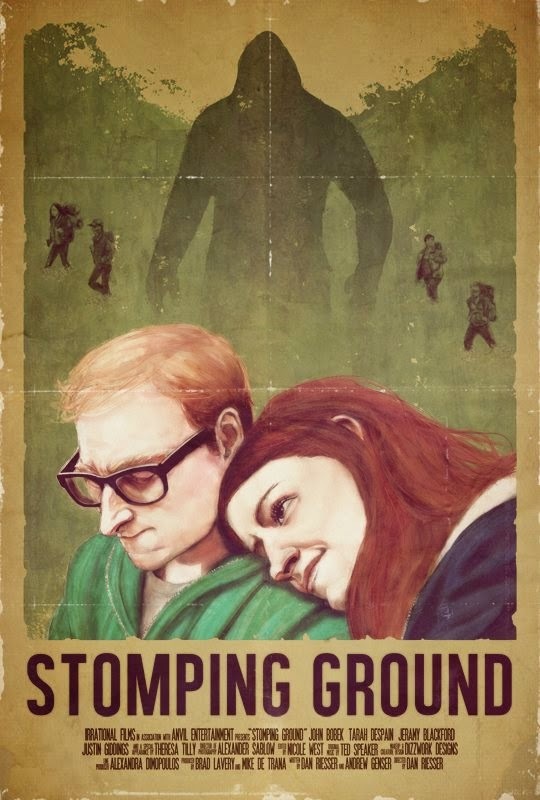 Recommended for fans of relationship comedies with substantial cryptozoological interest, Stomping Ground screens this Sunday (6/8) as part of this year’s Dances With Films.